U.S. Steel's Clairton Plant, the largest coke works in North America, in Clairton, Pa.
Two days later, a phone call from McKeesport: SMOKE IS FILLING WHOLE VALLEY CLEAR DOWN TO KENNYWOOD. HEAVY AND THICK, SMELLS HORRIBLE. They kept coming. Over three months, thousands poured in to the health department, by telephone, online, or through a smart phone app. 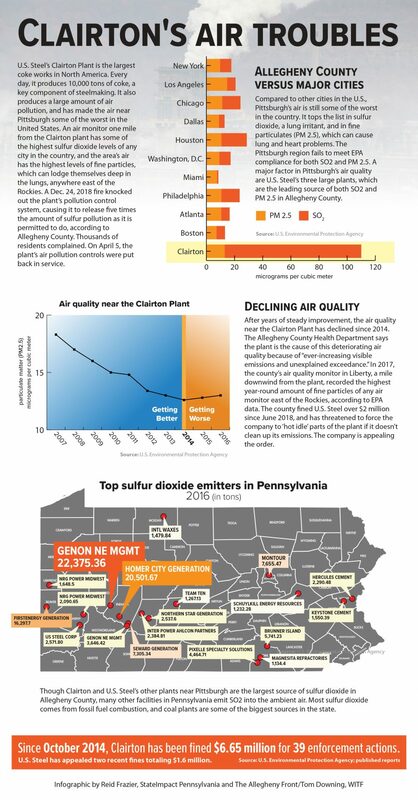 Complaints obtained from the health department reveal descriptions of an industrial stench wafting over the old milltowns of the Monongahela River valley — “A STRONG ODOR OF SULFUR” or “STRONG BURNING SMELL” — and resulting health effects: “It’s causing coughing for my husband and I,” said one person from Dravosburg on Jan. 3. The cause was U.S. Steel’s Clairton Plant. On Christmas Eve, a fire at the plant crippled its air pollution controls. For three months, the Pittsburgh area was blanketed with releases of sulfur dioxide much higher than usual. For two weeks, the public was largely unaware of the releases. On Jan. 9, after six spikes of pollution above federal air quality standards, the county issued an air alert for the area. Residents criticized the county for the lack of information before the warning. The county ultimately issued an April 15 deadline to the company to fix its pollution equipment. On April 5, 10 days ahead of schedule, the steelmaker finished its repairs. But worries about air pollution, and its health impacts, remain. The Clairton plant is the largest coke works in North America. To make coke, a key component of steelmaking, it bakes coal at high temperatures. The process creates sulfur-rich coke oven gas. The plant normally removes much of that sulfur from its waste stream, but the fire put a temporary halt to that. To dispose of the gas, before the pollution controls were fixed, the plant flared it at several locations throughout the Mon Valley. 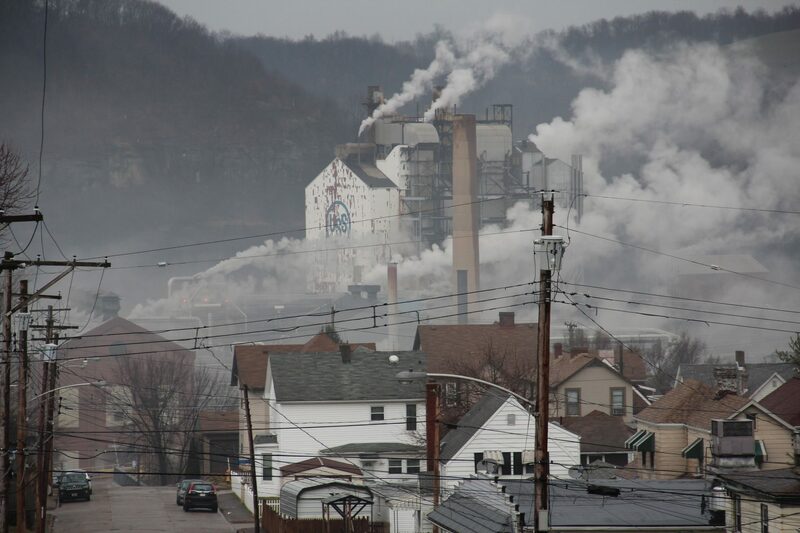 As a result, U.S. Steel emitted more than 70,000 pounds of sulfur dioxide (SO2) a day — five times the amount it’s permitted for, said Jim Kelly, deputy director of environmental health at the Allegheny County Health Department. “That’s a lot of pollution. It’s a lot of coke oven gas and so this a large opportunity for excess SO2,” Kelly said. 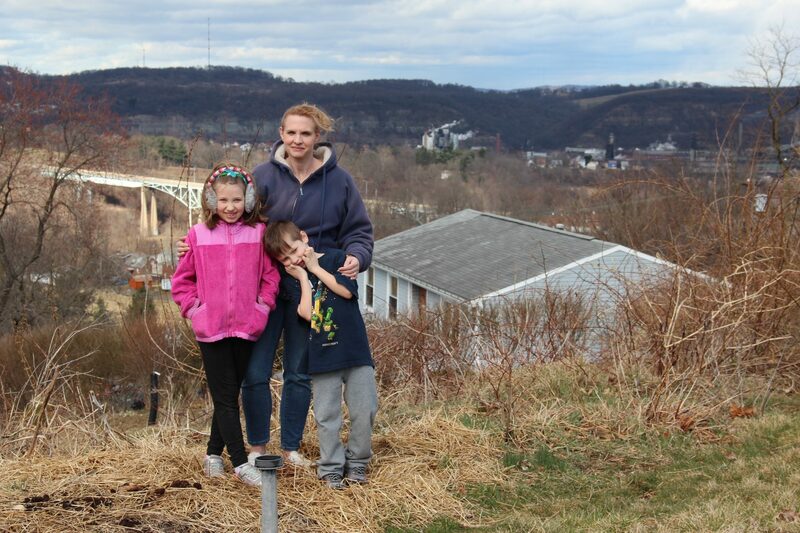 Doreen Luff, of Jefferson Hills, Pa., with her daughter Katie, 9, and son Jimmy, 6, in their back yard overlooking US Steel’s Clairton Coke Works. What it does is burn the nose and throat, obstruct airway passages, and make it hard to breathe. From her back yard on top of a hill, Doreen Luff can see the Clairton Plant — and smell it. “When the wind blows, it blows the sulfur up here pretty good,” she says. Since moving to her house in the community of Jefferson Hills 12 years ago, Luff could always smell the plant, some days worse than others. But after the fire, things got worse. On warm days, she keeps her windows closed. Her kids’ schools stopped outdoor recess on bad air days. And in January, her 9-year-old daughter Katie got asthma. Luff blames the plant. Jacob Fleming, of Glassport, said he started wheezing after riding his bike. “I’ve never had any issues breathing. I feel like I have asthma now,” he said. 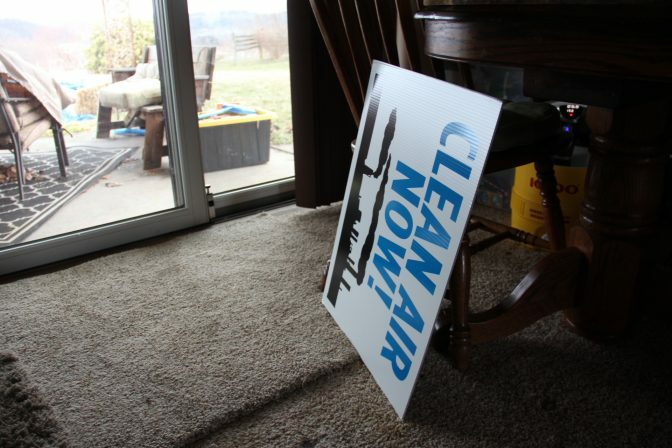 Inside Doreen Luff’s house in Jefferson Hills, Pa.
Environmental groups and angry residents criticized the health department for not doing enough to protect air quality after the fire. But Kelly says the agency did what it could, within the bounds of the law. Kelly said the department couldn’t just order the plant to close down while it fixed those controls because he didn’t think a judge would allow it. That’s because coke ovens need to stay hot, or else they break down. In February, the county tried to order U.S. Steel to put the plant on a hot idle — where the plant stays hot, but produces no coke. The agency backed down when it learned that U.S. Steel said it would have taken longer to put the plant on idle than to just repair its pollution controls. 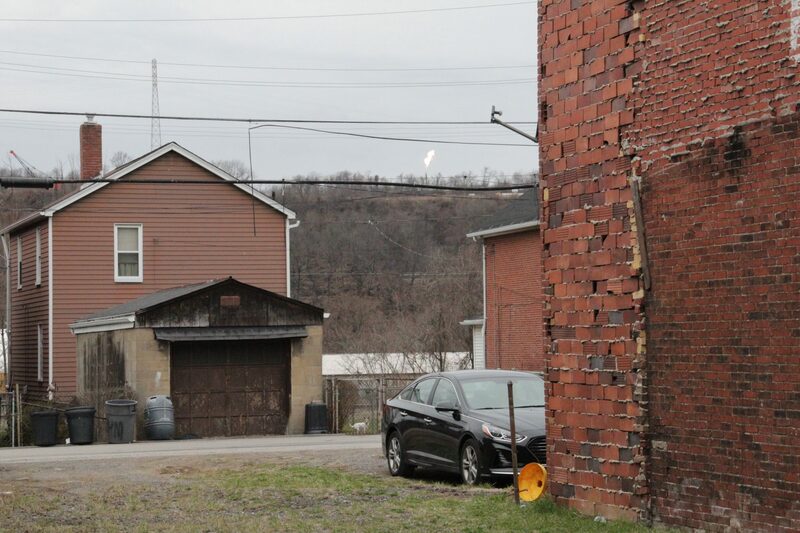 A flare at US Steel’s Irvin Works overlooks the town of Glassport, Pa.
One of U.S. Steel’s flares overlooks the nearby town of Glassport. Outside the Dollar Tree there where she works, Jennifer Magura said the air was so bad she got bronchitis this winter. Magura is a smoker, but says the kinds of breathing problems she’s had this winter are different. But some aren’t so bothered by the plant’s air pollution, as long as it is providing jobs. Hilda Lueckert of Clairton said she couldn’t really smell anything different in the air. She’s lived in Clairton all her life, and her son works at the plant. The Clairton plant employs 1,200, and supports another 1,800 jobs at two other U.S. Steel mills nearby. Lueckert remembers the days when the air was so bad in Clairton you couldn’t see your hand in front of your face. The plant is much cleaner than in those days, she said. U.S. Steel said it’s already spent $37 million in pollution controls since 2016, and is spending $65 million more to improve those controls. The company reported profits of $1.15 billion in 2018. Back at her home in Jefferson Hills, Doreen Luff says she’s thought about moving, but she doesn’t think her family can afford to right now. Her husband Bryan works for Verizon and she’s a stay-at-home mom. Her 9 year old daughter, Katie, said on some days, she has tried to hold her breath when she goes outside to wait for the bus. Luff is glad the mill has put the pollution controls back on, but she says some days the air is still unbearable. She hopes her headaches go away, and that her daughter’s breathing gets better, eventually.